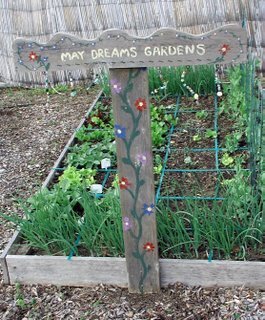 I made up this sign several years ago to put in my raised bed vegetable garden. It also serves as a tool rest. I attach it to the end of one of the raised beds, and then as I am working, I can lean my tools up against it. In this raised bed are my early spring vegetables. I've harvested some radishes, but I'm still waiting on the lettuce. The grid you see is my attempt at the square foot gardening method. This is the only bed I do this in, the rest of the beds I will just plant. The screening in the back blocks the view of my compost bins. Several years ago, one of my sisters suggested that the garden would look better if the compost wasn't in full view, so I got the bamboo screen. 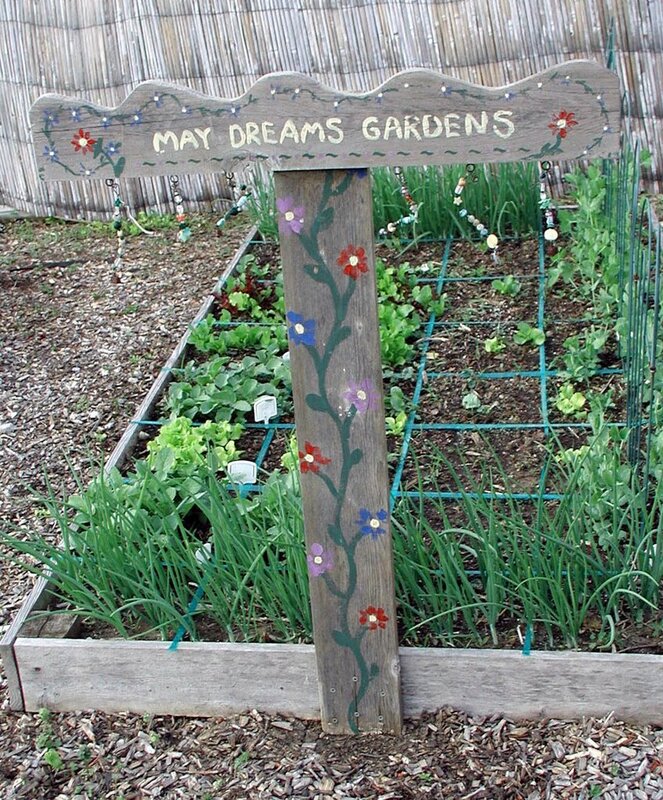 I have a privacy fence around the whole back yard, which blocks the neighbors' view of the garden, including the compost bins. Check out "My Garden Pictures" for some new pictures of several varieties of columbine blooming in the garden this week. What a nifty sign...and so practical, too!! Very nice. Thanks for your help teaching me about serviceberry, Carol! Love the sign! Especially the little beads hanging down. Ever thought about a side business?